Dr. Sidhu is a board-certified medical oncologist with expertise in treating solid tumors, blood cancers and hematologic disorders. She completed training in internal medicine and was a fellow in hematology and oncology at the Emory University School of Medicine. 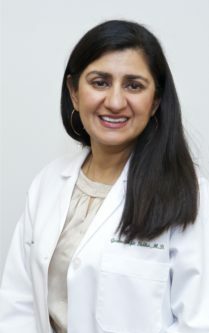 Dr. Sidhu currently serves on the Oncology Committee at Southern Regional Medical Center (SRMC) and she previously served on the Medical Executive Committee and Ethics Committee.